Pennfield Feed, the company known for supplying feed for the last four Olympic and World Games, and who made headlines late last year when they were awarded the designation of Official Feed of the USEF, has launched an exciting new two-month promotion for free feed. As the brand chosen for the four games (’02 Jerez, ’04 Athens, ’06 Aachen and ’08 Beijing), Pennfield prides itself in setting an honestly unmatched standard for quality, in formulas, consistency, and ingredients. But the proof is always in the horses. Riders like Karen O’Connor live by that rule. She’s fed Pennfield to her competition horses for almost three decades. 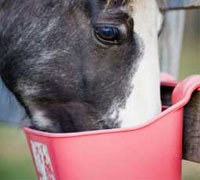 Pennefield wants all horse owners to give their feed a try with this special offer. For more information, or to find a dealer, visit www.pennfield.com/equinefeed/promo.cfm. I only wish I used their feed – how about it Nutrena. Care to match their promotion? 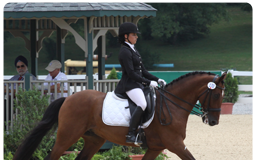 Hmmm – maybe I can get my barn to try this! thank you for this interesting and informative article. Good for them. I wish there were more companies like this. Great publicity too. You have probably saved many horses doing a buy one get one free promotion, i know at the time you ran this, i was going to have to put some horses down becuase of lack of income/work related cuts, your timely buy one get one feed got me thru a rough time, ALL feed companiies should offer this at a time of recession .. I used to use triple crown and purina, i will now stay with Pennfields, you care about the horse – not just the money..